May 8, 2015 • 5:41 am Comments Off on The Horror! The Horror! 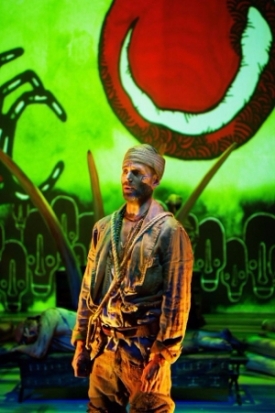 I wish I’d been able to see the American premiere of Tarik O’Regan’s opera based on Joseph Conrad’s Heart of Darkness. It was given by San Francisco’s Opera Parallèle in an all-too-brief production. Opera Parallèle’s production visuals enhance the move from scene to scene, adding to the music’s flow. A large screen fills the back of the stage, and across it projections splash colorful images of Ohio-based illustrator Matt Kish, taken from his book interpreting The Heart of Darkness, which offers one illustration for each page of the novella. Kish’s work is similar to that of many graphic novel artists: highly stylized with geometric and simplified forms; the colors are bright and primary with heavy black outlines. The imagery has the simplicity of cartoons, and also their instantaneous impact. Interestingly, the artwork was similar to Phillips’ graphic reworkings of the pages in The Humument.